The double standard in the media’s treatment of U.S. plans and actions (“us”) and those of our allies, on the one hand, and enemy/target plans and actions (“them”), on the other hand, applies at many levels. The United States has been intervening and fighting wars abroad almost continuously since World War II. This has involved frequent aggressions, using standard definitions of the word, with many of them extremely destructive, and with effects often not consistent with claimed objectives and very costly to U.S. taxpayers. But these cannot be designated “aggression” in our well-honed propaganda system. That word is reserved for dastardly actions such as the Russian takeover of Crimea. A useful introduction to the lexicon of aggression apologetics can be read from a piece on “Our New Isolationism” by Bill Keller, published in the New York Times on September 9, 2013, and aimed at justifying an enlarged U.S. participation in the war on Syria. Keller, the Executive Editor at the Times for some eight years (2003-2011), was the sponsor of reporter Judith Miller’s notorious war propaganda, and he himself led the Times to support the invasion-occupation-destruction of Iraq from 2003. It is amusing to read Keller in 2013 saying that, “To be sure, nothing has done more to discredit an activist foreign policy than the blind missionary arrogance of the Bush administration [in Iraq and Afghanistan].” But if Keller could swallow the fairly obvious lies of Bush war propaganda ten years earlier, and ignore throughout the Iraq war and occupation the gross violations of international law, why should anybody trust his judgment as he tries to rationalize the next war? What does it tell us about the paper that he could survive there as a leader for eight years (and many more as a reporter, Managing Editor and columnist) and still be able to use it for more war propaganda a decade later? We may note that in 2013 Keller didn’t use the word “aggression” to describe the invasion-occupation of Iraq, nor is Bush described in negative terms beyond “arrogant” even after having destroyed a country and bearing prime responsibility for the killing of possibly a million people. Bush pursued an “activist” foreign policy, and in this article Keller calls for more “activism,” though not with “missionary arrogance,” but only with imperialist-apologetic arrogance. The new target, Assad, is a “merciless dictator,” whereas Bush is not merciless but only arrogant. Keller has other euphemisms for pre-approved military interventions abroad: there is “foreign engagement,” “a more assertive foreign policy,” and “calibrated interventions to shift the balance.” And no question is raised as to the motives behind any new distant military intervention by us. Keller clears the decks of any possible non-benign or less-than- benevolent aims: he dismisses the idea that the Israelis might be “duping us into fighting their wars,” but he doesn’t mention AIPAC or any neocon influence on policy, and of course he never mentions the military-industrial complex and its possible influence on policy. He is just sure that our “vital interests” are at stake in Syria and he hopes that Congress can elicit from the President a recognition of those interests and a “strategy that looks beyond the moment.” Only rival states and those competing with us or our allies have expansionary internal dynamics and dubious aims. Leaving this comic book-worthy analysis and getting back to the omnipresent double standard, a conspicuous manifestation is in the media’s use of “purr” and “snarl” words and comparable phrases. The United States and its allies and their leaders are never “merciless dictators” and “butchers” that commit “horrors,” but Assad can be so described (“Syria’s Horrors,” ed., NYT , Feb. 25, 2012; “Assad the Butcher,” ed. NYT, June 9, 2012; Keller, above). Only leaders of enemy/target states have “tantrums”; (“North Korea’s Latest Tantrum,” ed., NYT, July 14, 2010), resort to “cash and charm” to create divisions among target states (“With Cash and Charm, Putin Sows E.U. Divide,” NYT, April 7, 2016 [the NYT almost never mentions Putin without denigrating adjectives, in a kind of lengthy childish tantrum of its own]); make “brazen nuclear moves (“North Korea’s Brazen Nuclear Moves,” ed, NYT, May 2, 2016); or need to be “reined in.” (“The Best Chance to Rein in Iran,” ed., NYT, July 15, 2015). Surely Israel and the United States don’t have to be reined in; Israel’s steady dispossessions and periodic major assaults are only retaliating and protecting its national security in the face of inexplicable Palestinian terror. The United States was busy “containing” the Soviet Union as the U.S. built its world-wide system of military bases from 1945 to 1990, and it has recently been compelled to contain Russia as the Soviet successor regime threatens all of its neighbors, who cower in fear while the United States seeks to reassure them with denunciations of Russia, arms, bases, training exercises and efforts to get the major EU countries to increase military spending. Poor NATO has been driven by this resurgent Russian imperialism into defensive responses (Eric Schmitt and Steven Lee Myers, “NATO Refocuses On the Kremlin, Its Original Foe,” NYT, June 24, 2015). We only respond as Russia provokes and tests us (Steven Castle, “Russia Tests Distant Water, Resurfacing Cold War Fears,” NYT, May 11, 2015). It is not permissible in the mainstream to suggest that the Kremlin is the one engaging in defensive moves against an expanding NATO; that the U.S.-NATO sponsorship of an anti-Russian coup in Kiev in February 2014, which threatened the major Russian naval base in Crimea, virtually forced a Russian military response. This is avoided in the Times and its confreres by ignoring the coup and its U.S.-NATO link and blacking out the fact that NATO has been steadily expanding and encircling Russia since 1996, perhaps regarding this process as anticipatory self-defense. The ability to get indignant over the casualty-free Russian takeover of Crimea, by the government that invaded Iraq in a not-casualty-free war of choice only a little more than a decade back, is startling. It is testimony to the power of the double standard and the ability of politicians at home and in the EU, media and public to block out inconvenient facts. On the same topic it must be considered an Orwellian classic of forgetfulness that Kerry could have stated in 2015 that, “You just don’t in the 21st century behave in 19th century fashion by invading another country on a completely trumped-up pretext” (“Face the Nation,” CBS News, March 2, 2015). This was not only a perfect case of purposeful forgetfulness, it was a double lie, as the Russians had a real national security case for their action, whereas the true “trumped up case” was the one concocted for the Iraq invasion. But no U.S. mainstream publication chortled at Kerry’s Orwellian performance. Interestingly, the interviewer on this program made no comment and asked no questions about this claim of a Soviet invasion of Ukraine and Germany in World War II. (See Lena Sokoll, “Ukraine Premier’s Pro-Nazi version of World War II: USSR invade Ukraine, Germany,” WSWs.org, Jan 19, 2015.) And you may be sure that neither the New York Times nor any other mainstream English language publication reported this nugget. It should be recalled that Yatsenyuk is the “Yats” who U.S. official Victoria Nuland suggested before the February 22, 2014 coup in Kiev would be an appropriate choice to head the new regime, and who did in fact soon become Prime Minister. 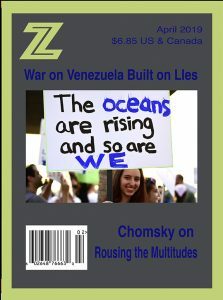 Just as the “lie that wasn’t shot down” about Korean airliner 007 served the Cold War militarization plans of the Reagan administration, so the media’s handling of the shooting down of the Malaysian airliner MH-17 flying over Ukraine on July 17, 2014, has served the Obama administration in its anti-Russian campaign. U.S. officials, led by John Kerry, immediately claimed that they had tracked the killer missile, knew exactly where it came from and that it was the Russian-backed rebels who did it. But the U.S. intelligence report that soon followed indicated that there was uncertainty as to the perpetrators, and there was no evidence that the rebels possessed Buk missiles that could have reached the necessary 33,000 feet. The Kiev government forces did have such missiles and capability. However, in another telling manifestation of the ability of the powerful to use disinformation to convert a tragedy into a propaganda coup, Kerry’s evidence-free and dubious accusations immediately became a Western truth that was used to smear the Russians and underpin a new sanctions regime against them. A very sluggish investigation into the shootdown was organized by the West, with the NATO-member Dutch in charge, the Russians excluded and the Kiev government a participant with a veto power over the findings. The report which followed, after over a year lag, concluded that the plane had been shot down by a Russian-made Buk missile, but it came to no firm conclusion on the directly responsible parties. The United States has still not produced its evidence showing rebel-Russian guilt, but the DSB failed to mention, let alone criticize, this U.S. silence, and its focus on the Russian-made Buk as the instrument of destruction made it possible for the Western media to continue the initially established guilt claims against Western targets (Russia and the “Russian-backed rebels”). Edward S. Herman is an economist, author, media and foreign policy critic.